NCAT Asphalt Content Furnace - Gilson Co. The AP-20 Thermolyne NCAT Asphalt Content Furnace automatically determines the asphalt content of paving mixtures from 1,200—1,800g in just 30-45 minutes. Samples up to 5,000g can be processed at extended testing times. The costs of solvent and solvent disposal, as well as related safety concerns are eliminated. An internal electronic balance automatically monitors sample weight throughout the ignition process and determines endpoint, saving valuable technician time and increasing productivity. 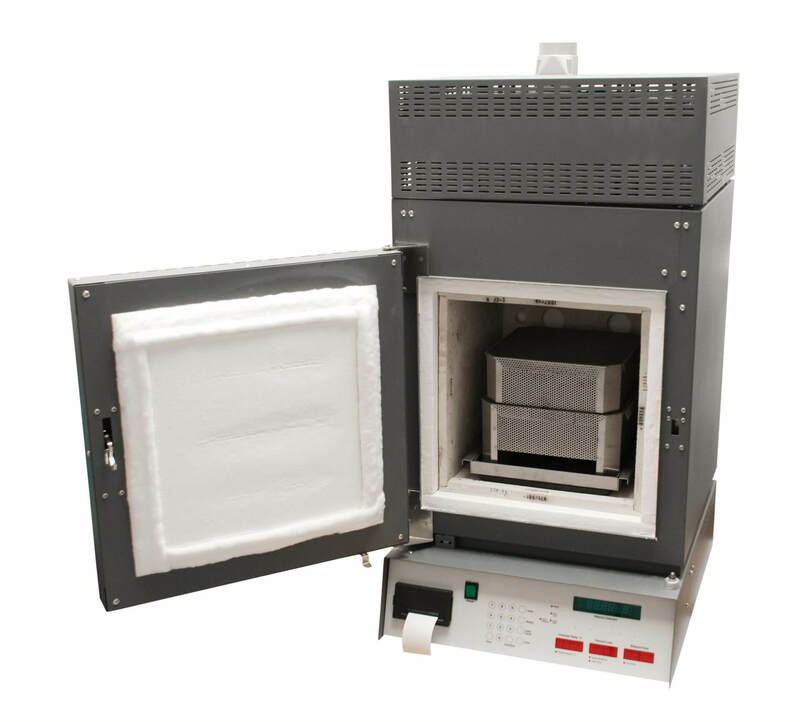 The furnace is pre-heated to the default setpoint temperature of 538°C (1,000°F) and a hot-mix asphalt sample is weighed, divided into two screened baskets, and placed into the furnace chamber. The sample weight is entered along with a mix design calibration factor, and the test is started with the push of a button. At completion, the system automatically ends the test and prints the results. Once the test is initiated, the door remains locked until completion. An automatic door-locking system provides operator safety and test integrity during critical burn-off times. During burn-out, volatiles are further oxidized in a high-temperature afterburner with a patented ceramic filter heated to 650°C (1,202°F), reducing emissions by 95%. The NCAT Furnace can also operate in a manual mode where it will beep when endpoint is detected but continue to test until the operator presses "stop" to unlock the door and print the results. Weight change due to temperature change is automatically compensated for each sample tested, and correction factors can be entered to accommodate unique mix characteristics. Endpoint detection of the test cycle can be user-programmed for a weight loss between 0.01% and 0.5% for three consecutive readings. Test results are computed as asphalt content per total weight of sample, or bitumen ratio per weight of dry aggregate to an accuracy of ±0.11%. A 24 hour/7 day timing function can be programmed to preheat the furnace at any time of day. The modular, refractory embedded heating elements have an extended service life and are easy to replace. An RS-232 port provides data interface with a personal computer for graphical data analysis. An Electronic Balance, Hearth Tray, six replacement Fuses and an operation manual are included. The APA-25 Starter Kit is required with operation of the furnace and includes two Sample Basket Assemblies, Transport Handle, Aluminum Cool Down Plate, Cool Down Safety Cage, four rolls of Printer Paper, Basket Brush, and Motor Lubricant. For increased safety the kit includes Head Gear with Face Shield, and Heat Resistant Gloves. NCAT Furnaces are not supplied with power cords and must be hard-wired directly to a suitable electrical supply or supplied with a cord and plug by the user.